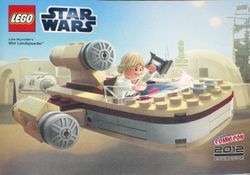 Luke Skywalker's Mini Landspeeder is a set released for the 2012 New York Comic-Con. The set was released in a tin, and only 1,000 of the sets were made. Several views of the set. Facts about "Luke Skywalker's Mini Landspeeder"
This page was last edited on 18 August 2017, at 00:56.